For All Openings. Fill your home with the natural beauty and warmth of solid wood with the Exclusive Wood Doors IW-00. Architecturally inspired, our interior wood doors can be designed to fit any opening in any style. Standard or awkward, large or small, we have a solid solution for you. Our interior doors are available in all designs and sizes. Our doors styles include all panel, glass panel and louver designs to fit your desired look. Bifold doors provide the perfect solution for closets or tight spaces. Select a matching design, or simply mix and match your interior door designs. Let’s Be Creative. 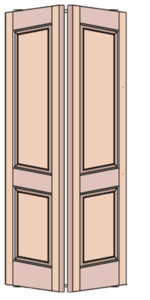 If your struggling to find a solution to an odd opening, we are happy to create a specialty door for your application.